Use your favorite bright-colored vegetables in your Pasta Primavera. Photo courtesy Wisconsin Milk Marketing Board. 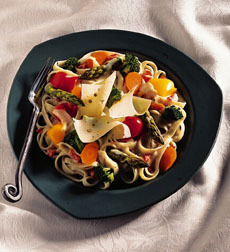 CAPSULE REPORT: Pasta Primavera is easy to make, pretty to look at and can be served hot or cold. There are many variations on the recipe. “Primavera” means “Spring” in Italian; the idea is to use bright-colored vegetables that evoke the bright floral colors of Spring. You can use almost any pasta from fettuccine to corkscrews (see our Pasta Glossary for options). This recipe is adapted from the Sable & Rosenfeld Elegant Entertaining Cookbook. There is no one “set” recipe for Pasta Primavera. It can be enjoyed hot or cold, with a variety of different sauces or vinaigrettes and different shapes of pasta. And the vegetables in this vegetarian pasta dish can be whatever looks best in the market. A combination of red, green, yellow and orange colors will make your dish look the most tempting. Makes 4 servings. Serve with green salad and crusty bread. For a special touch, serve with garlic bread hot from the oven. In a small skillet, heat butter; add shallots and sauté over low heat for 2 minutes. Add peas, zucchini, carrots, tomatoes and wine. Cook 5 minutes. In a large pot of salted boiling water, cook noodles for 6 minutes, or until al dente. Drain thoroughly. In a large salad bowl, combine noodles and vegetable mixture. You can make Pasta Primavera with any style of pasta. 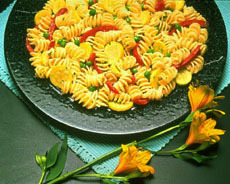 Here, fusilli are used. Photo courtesy National Pasta Association. In a blender or food processor, combine mayonnaise, olive oil, parsley, garlic, wine, oregano, basil, salt, pepper, lemon juice and rind. Process 1 minute, until mixture forms a smooth sauce. Pour dressing over noodle-vegetable mixture; toss gently. Refrigerate. At serving time, sprinkle generously with Parmesan cheese and garnish with prosciutto.